WARSAW, Poland (AP) — The new mayor of the Polish city of Gdansk says a statue of late Solidarity-era priest Henryk Jankowski, at the center of allegations he abused minors, should not stand in a public place. The statue recognizes Jankowski’s staunch support for the Solidarity pro-democracy movement in the 1980s, born out of Gdansk shipyard workers’ protest. But the abuse allegations led three men to overturn it one night last month. Shipyard workers put it back up. Mayor Aleksandra Dulkiewicz said late Monday both actions were illegal and hampered peaceful dialogue about the monument’s future. She said the statue should stand on private property, without specifying. It could mean church land. 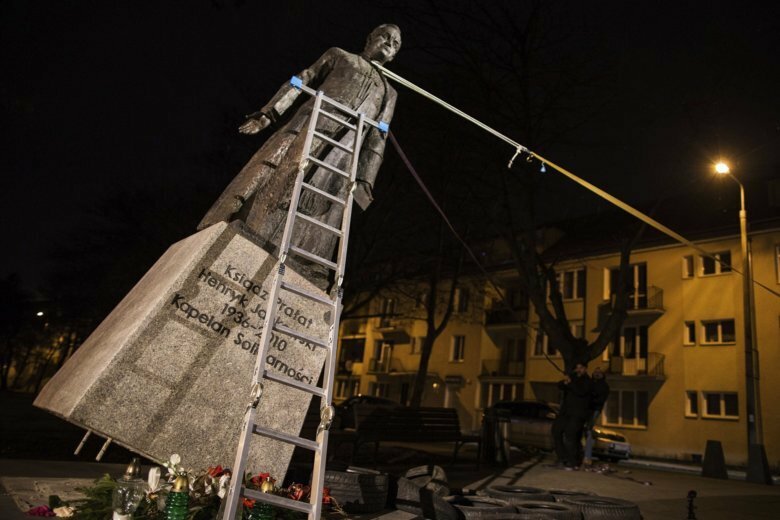 On Thursday, Gdansk councilors are to debate whether to dismantle the statue.